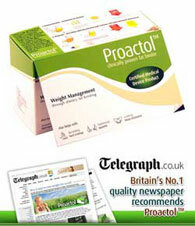 Proactol is a non prescription weight loss pill that has been available to buy since late 2005. Proactol is very much a natural product and a world apart from some of the pharmaceutically produced weight loss products that are available via prescription. The non prescription weight loss pill market is governed by a different (weaker) set of rules and regulations to the more drug based medicinal products and so this gives manufacturers license to embellish and overstate the efficacy of their products. PLUS has now superseded Proactol. Proactol Plus can bind 27% of fat and stop it from being absorbed by your stomach and also reduce calorie consumption by 300 per day. Recently the ERSP (Electronic Retailing Self-Regulatory Program) was formed to help curb outlandish claims made by manufacturers and assist the consumer to trust that the product they were intending to purchase did what it said on the tin. 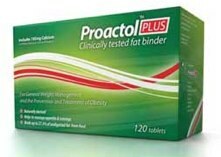 Proactol is a natural fat binder and shares similarities with Xenical in so much as it can stop the absorption of approximately a quarter of dietary fat from being digested from food consumed. Or put another way – only 75% of the potential calories taken on will appear in the places you don’t want them to. A completely natural product that to date is not proven to produce or cause any adverse reaction. Proactol first became critically acclaimed largely due its a appearance in national newspaper The Daily Express – 21 year old Laura Price shed a third of her body weight and six dress sizes with help from the fat binder. More recently The Daily Telegraph published the results of a survey in which thousands of successful slimmers were asked to reveal their top 5 ways to lose weight – Proactol was one of the 5. US publication Florida Style considered Proactol as one of the best ways to lose weight after childbirth. If you do not qualify for prescription weight loss pills (a BMI of below 30-35) Proactol is possibly your best chance of success within the non prescription market place. Proactol is available to buy direct from the manufacturers. Orders can be placed either online or via the telephone.